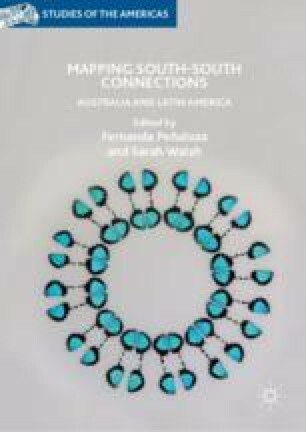 This introduction discusses the development of the field of Latin American Studies in Australia to consider its place in the broader academy. It outlines some of the current trends in the field, both positive and negative, and suggests some potential research agendas. Ultimately, it argues that Latin American Studies in Australia has never been (and should not seek to be) a re-creation of American or British models. Rather, Latin Americanist scholars in Australia generate unique research questions and agendas due to their own peripheral status as inhabitants of the Southern Hemisphere. Belém Lopes, Dawisson. 2018. Australia’s Unapologetic Dismissal of Latin America Canberra Is Simply Not Looking East. How Wise May This Bet Prove? The Diplomat, May 30. https://thediplomat.com/2018/05/australias-unapologetic-dismissal-of-latin-america/. Accessed September 16, 2018. Hanley, Jane. 2016. Nettie Palmer’s South to South: Australia, Chile and Writing the Nation. Transnational Literature 9 (1): 1–13. http://fhrc.flinders.edu.au/transnational/home.html. Accessed October 10, 2018. Herrera, Adriana. 2002. María Fernanda Cardoso: The Transgression of Custom. http://www.latinart.com/transcript.cfm?id=40. Accessed July 7, 2018. Wilde, W. H. 1983. Gilmore, Dame Mary Jean (1865–1962). Australian Dictionary of Biography, National Centre of Biography, Australian National University. http://adb.anu.edu.au/biography/gilmore-dame-mary-jean-6391/text10923. Published first in hardcopy 1983. Accessed September 9, 2017.